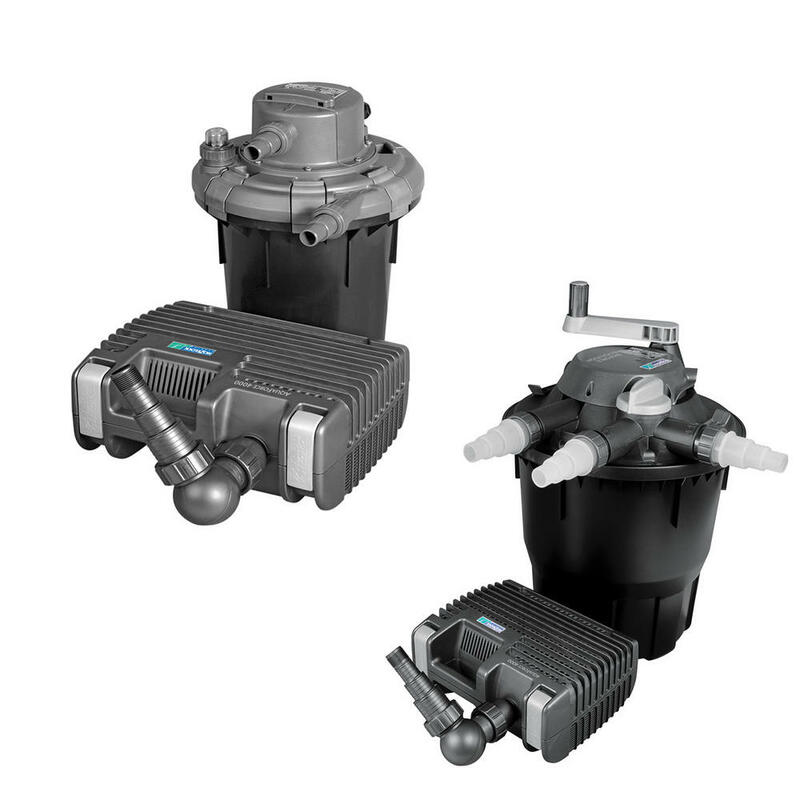 The new Bioforce filter system is pre-assembled for easy installation with a new pond or an existing filtration system. The unit can be hidden at the side of a pond or buried in the ground up to the level of hose inlets. The pressurised filter allows the water to be pumped to a higher exit point to create relaxing waterfalls. Through flow coarse foams reduce the filter cleaning frequency. Profiled foams present a larger surface area for the efficient removal of waste. Layered foam makes thorough cleaning easy. Bioforce has an excellent biological filtration with Kaldnes K3 biomedia exclusive to Hozelock Cyprio filter systems. Kaldnes is scientifically proven and in widespread use in industrial water purification processes. As a result, it has vastly superior biological capacity compared to other biomedia used in pond filtration. High efficiency single-ended UV lamps and in-built water turbulator ensures maximum water treatment and the elimination of green water. 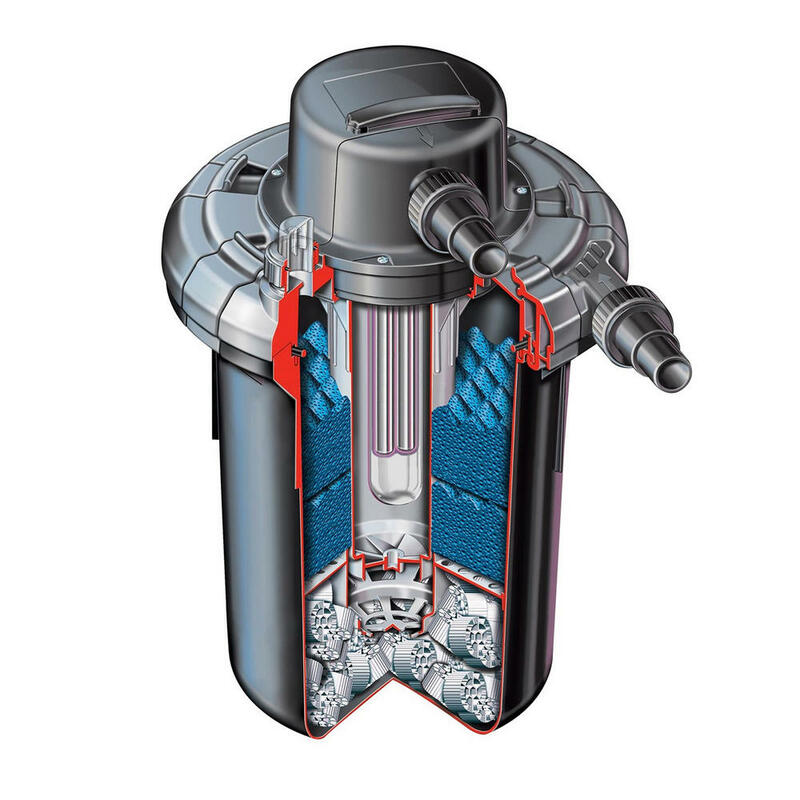 The full Bioforce range has an easy clean backflush facility for flushing debris out of the filter, thereby extending the time between thorough foam cleaning. This is also aided by the use of flow through coarse foams, which efficiently remove waste particles whilst also reducing cleaning frequency. The Bioforce Revolution Systems feature all the benefits of the standard bioforce systems but also benefit from the use of CypriCube foams with +50% surface area ensure clear water and facilitate an easy cleaning mechanism. So no more dirty hands simply turn the handle to activate the internal cleaning blades that separate solids from the Cypricube foams. Pressurised filtration without clogging or flow loss unique Cypricube foam filters effectively remove waste but do not clog like traditional foam filters. An extremely efficient filter and waterfall pump. The Aquaforce case incorporates an exclusive wildlife protection system; protecting small fish, newts and frogs from accessing the pump. The Wildlife Protection System reduces the risk of damage to common pond wildlife. For extra protection of species such as newts we recommend using an additional cage, available as a spare part.